When Suicide Is 'Buzzing Around' NPR's Scott Simon reflects on recent celebrity suicides and the danger of more people taking their lives, and offers advice on where to turn for help. Designer Kate Spade is pictured in April 2017 in New York City. Anthony Bourdain is pictured in April 2018 in New York City. Both died in the same week. I have to talk in an utterly personal way about suicide. My grandmother took her life, and my mother, who struggled against the impulse several times, said, "Suicide puts a fly in your head. It's always in there, buzzing around." 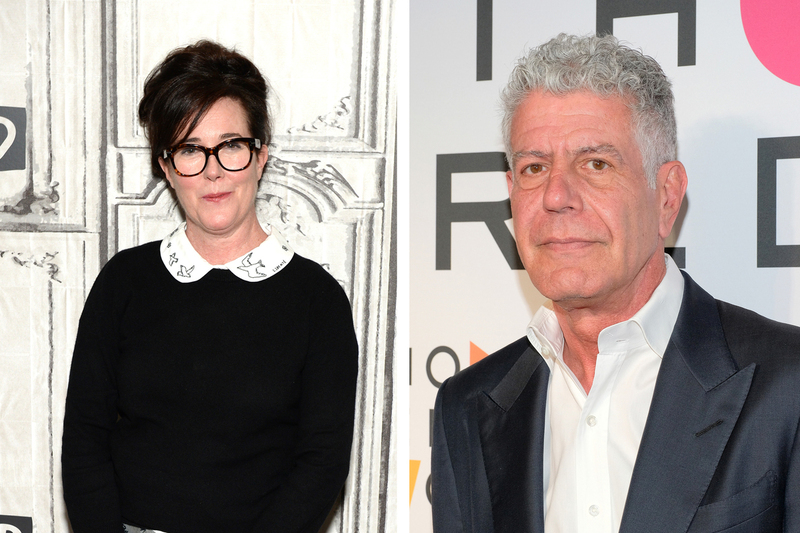 The apparent suicides of Kate Spade, the accomplished fashion designer, and Anthony Bourdain, the spirited traveler and chef, occurred the same week the Centers for Disease Control and Prevention reported that the suicide rate has increased more than 30 percent in half of states in the country since 1999. Suicide is now a major public health crisis in this rich and blessed land. It is risky to make generalizations about suicide — whether it appears to have been triggered by depression, job loss, sickness, romance, drink or drugs. The person who takes their life may feel alone and isolated. But they leave behind those who love them and who are left to wrestle with sleepless regrets and ceaseless wondering. Maybe that's why suicides can run in families. Dr. Clarence Hemingway killed himself in 1928. One of his sons, Leicester, discovered his father's body. Another son, Ernest, then a young novelist, wrote his mother-in-law: "I'll probably go the same way" — and took his life in 1961, just a few years after winning the Nobel Prize for Literature. In the years that followed, his sister Ursula and brother Leicester Hemingway also took their lives. And Margaux Hemingway, the model who was Ernest's granddaughter, took her life in 1996. Each of their stories was different; but each of them had that fly of a thought of suicide, buzzing in their heads. And there are ripples from suicide. Comedian Robin Williams killed himself in 2014, and there was a 10 percent increase in suicides in the four months that followed. That syndrome is now called "the celebrity suicide effect," what David S. Fink at Columbia University described to CNN as, "the consequences of a celebrity suicide in the digital era." You have to wonder — worry — whether that might happen now, too. Someone who struggles with suicide may think it will end their pain. But it will also inflict a pain that can pass from person to person, one generation to the next. If you struggle, you can call the National Suicide Prevention Lifeline at 1-800-273-8255. Or call 911. Or walk into a hospital or up to a police officer and say you need help. Walk into a church, mosque or synagogue. Walk up to a stranger if you have to — the kindness of strangers can be real. Do not suffer in silence or isolation. You can help save others, as well as yourself.